Brand-new nordic ski and snowshoe trails open at Little Gore Mountain. A variation on the “More Gore” marketing theme at Gore Mountain Ski Center fits nicely at the North Creek Ski Bowl: “More Nordic.” The historic site, operated by the Olympic Regional Development Authority in partnership with the Town of Johnsburg, now offers cross-country ski facilities, a direct result of the non-winter weather of 2015-16. Once famous as a pioneer in winter sports in New York’s Adirondack Mountains, the Ski Bowl languished but has come back to life in the past 15 years and is flourishing again at the base of Little Gore Mountain. It is connected to ORDA’s seemingly ever-growing Gore Mountain center and offers a full menu of activities—Alpine and Nordic skiing, a terrain park with a half pipe, ski/boarder cross and snowshoeing under the lights on its grounds. 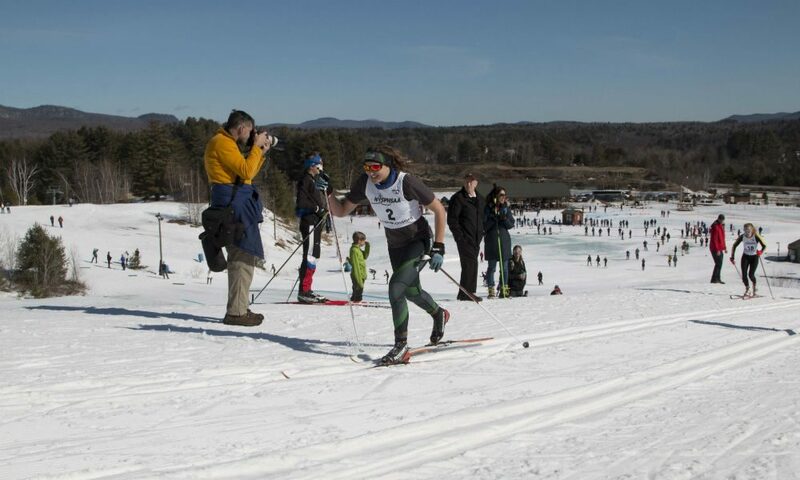 The new Nordic and snowshoe network open to the public was developed over the summer following a successful experience of hosting cross-country races last winter. The overall turnaround at the Ski Bowl is the result of several factors, including efforts by FrontStreet Mountain Development LLC to bring its ambitious Ski Bowl Village at Gore Mountain project to reality. David Crikelair, who has been skiing at Gore Mountain since the 1960s, is the managing partner. His son, Mac, is the project manager. FrontStreet—working with over 400 acres that it intends to turn into a four-season sporting club community of hotels, townhouses and private residences—has made land transfers totaling 73 acres with the Town of Johnsburg that allowed for the expansion at the Ski Bowl. The first land deal led to the construction of the Hudson triple chairlift, which opened in January 2011, to replace the long-closed T-bar. The addition of the Hudson chair was the link to the interconnect with trails at Gore Mountain, and the Ski Bowl became a second entry point to the state-owned ski center. In September 2015, FrontStreet announced the transfer of 35 acres that will enable ORDA to offer more trails off the Hudson chair. A vibrant Ski Bowl is essential for FrontStreet, as it markets and sells its property as a ski-in/ski-out resort. ORDA has made some changes in its operational plans for the Ski Bowl, which have expanded the space open to cross-country skiing and snowshoeing. Tubing—a staple at the Ski Bowl since ORDA began managing that site in 2002—has been discontinued and some of that part of the venue has been repurposed for cross-country skiing. The Ski Bowl has nine loops—the longest at 2.5 kilometers—for skiers of various abilities. Some three kilometers of the total of nearly five kilometers have lighting and snow making. Being able to produce snow for the groomed courses assures a viable season during a winter with very natural little snow, as was the case last year. Mike Pratt, the longtime general manager at Gore, who will become the interim president and CEO of ORDA in February when Ted Blazer retires, says that the Nordic expansion meets a grow- ing demand and has been well received. After seeing what could be done last winter to accommodate cross-country skiing with snowmaking in place, ORDA improved the trails in the summer of 2016 so they could pass certification by the International Ski Federation to be used as race courses. “Those standards are very tricky in Nordic,” Pratt says. “They require certain hill climbs and a lot of different standards, and we met it.” The inspection has been completed and ORDA was awaiting the official documentation. Traditionally, cross-country ski races started and finished at the same spot, but most of the competition occurred on trails well out of sight of the public. ORDA took a different approach and set up the Ski Bowl to make the races spectator friendly. The 2016-17 season opened in early December when 215 competitors took part in Section II high school races. Cross-country skiing has been popular in the Adirondacks for decades, and more Americans began to embrace the sport after Bill Koch of Brattleboro, Vermont, earned a silver medal in the 30-kilometer race at the 1976 Winter Olympics at Innsbruck, Austria. Forty years ago, there were very few high schools in the Capital-Saratoga Region that had ski teams. That has changed quite a bit through the decades—there were 13 districts participating in Nordic a year ago—and the Ski Bowl has become an important location for high school and age-group races. This season, the Ski Bowl is scheduled to be the site of many Section II events and its championships, more NYSSRA races and two Junior National qualifiers. It is part of the evolution of the Ski Bowl, which traces its roots to the arrival of the first snow train on March 4, 1934, carrying nearly 400 members of the Wintersports Club of Schenectady. Buses and trucks took skiers up the road to the Barton Mines for the ride up, slide down adventure. The community purchased 250 acres in 1935 to develop what became the Ski Bowl. During the winters that followed, trains brought skiers from Manhattan to North Creek, and events at the Ski Bowl in the 1930s were routinely writ- ten about in major newspapers on the East Coast. The ski industry grew after World War II, and the Ski Bowl faced increasing competition from many other venues, especially nearby Gore Mountain, which opened for business in 1964.